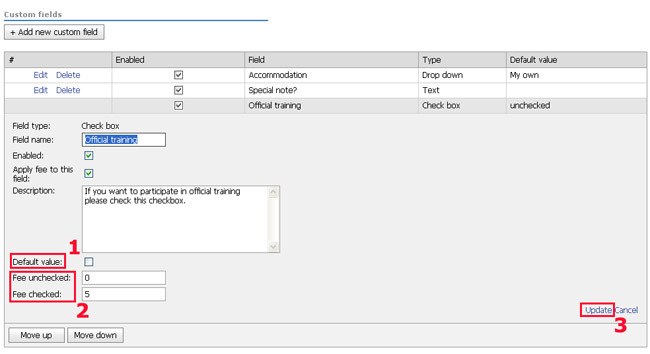 You can use Additional fields for entry forms of already created events. 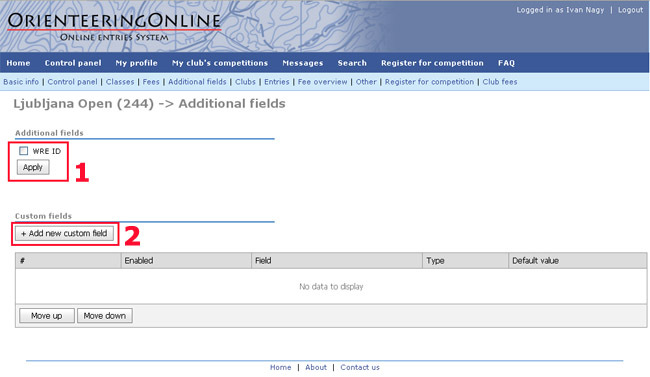 On "Additional fields" page you can first check the "WRE ID" checkbox (1) if you are organizing a WR Event. 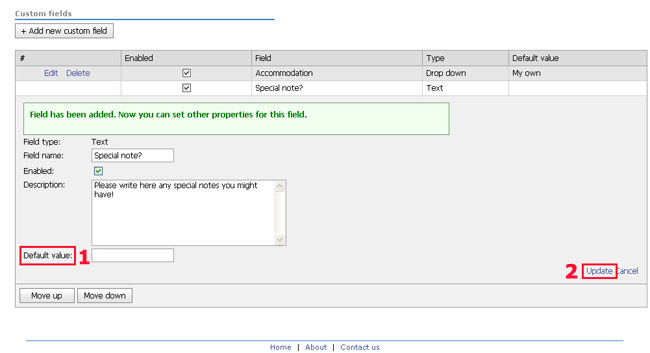 Then click the "Add new custom field" button (2) for further Additional fields. Field name: This is how you want the field to be named. Enabled: You can any time check or uncheck this checkbox. In case it is disabled this Additional field will not be visible on the entry form. Field type: Here you can choose between Drop down, Text and Checkbox types. Apply fee to this field: Check this if you want to charge fee for items in this field. Description: This is an explanation of the field which can be seen by runners when they point their mouse over custom field column in entry form. Often this is left blank. After you fill in the necessary data, don't forget to Update the form (2). 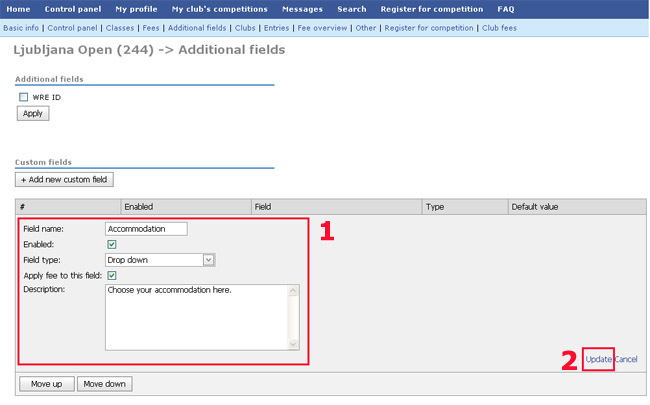 If you chose Text type of Additional field you will only have to write default value, that is what competitors will see when they open Entry form (1). Usually this is left blank. Display text (1) - that is the text that will appear in drop down menu for that particular value. Max number of competitors (2) - This is only used when you want to set the upper limit of competitors who can choose this option. For example, you have space for 80 competitors to lodge in the gym hall, so you want to limit this option to 80. When this number is reached all the following competitors will not be able to opt it. Fee (3) - If you checked "Enable fee to this field" you will have to write a value here 0-XY. Value (4) - this is the value for Export purposes. If you will process this data in some other application you might want to set a value here. You can also leave it blank. 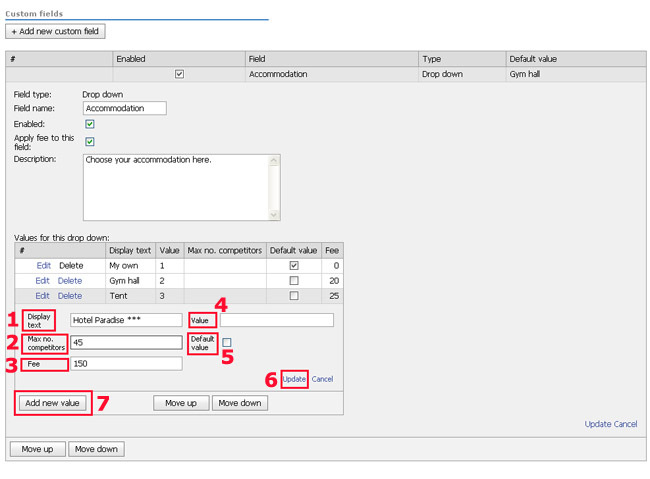 Default value (5) - this is the default value that is set on the entry form, when competitor opens it. When you setup all the boxes, don't forget to Update the form (6). If you chose Checkbox type of Additional field you will need to Check/Uncheck Default value (1). For example if you expact that the majority of competitors will want to have this checkbox checked you may as well set the default value as checked. Then, if you opted for fees in this Additional field, you will have to set them up in "Fee unchecked / checked" boxes. 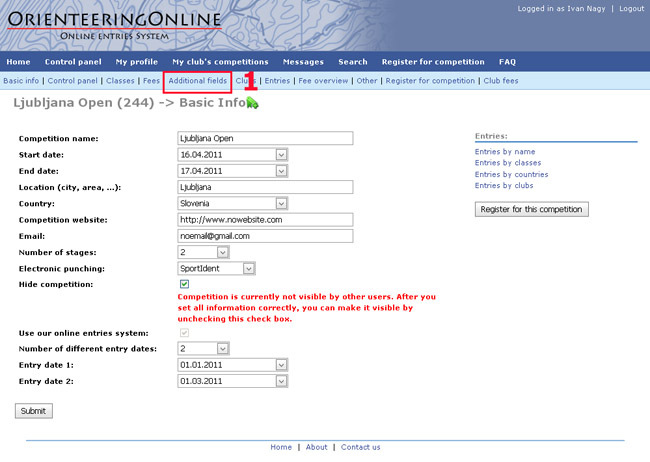 When you are finished do not forget to Update the form (3).